Planning a little 'time out' in nature for some pictures of wildflowers? Take a breather... and your camera... while Mother Earth gives your body and soul a tune up. You may not have to wander far. 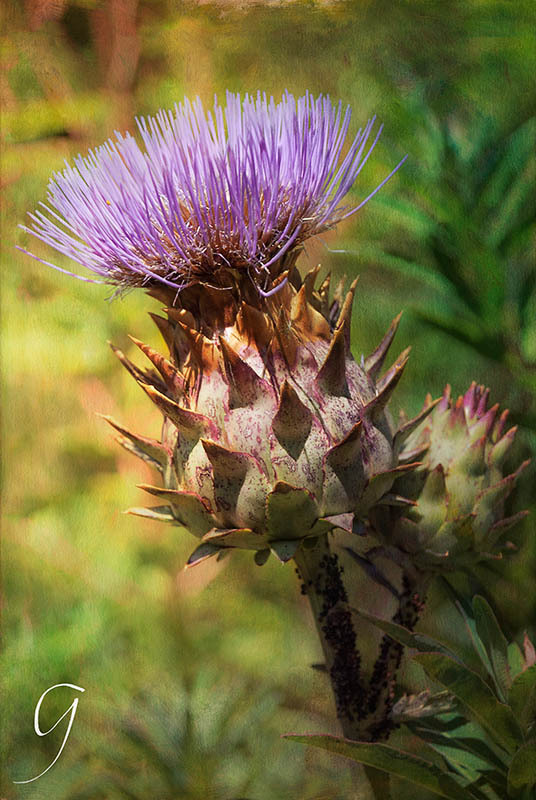 A Cirsium thistle. This plant was about 4 feet tall and the flowers were huge. Please don't sit on this prickly plant! Some people are replacing their high maintenance lawns with natural wildflower gardens and I give that two thumbs up. If you have a wildflower lawn nearby, use it. On occasion, I've asked if I could pick a few to take home to photograph in my very simple home photo studio. That's my alternate plan if there's too much of a breeze to photograph outdoors. But, being out in nature is choice #1. Where I live, it's a quick walk into the forest. En route, there's a little cottage with a lush wildflower 'lawn' and I stop and admire whatever is blooming. Hannah lives there... an older German lady. She tends to the Echinacea and poppies, foxglove, daisies and lots more. I'm so, so grateful to live here on Vancouver Island. I lucked out with both the ocean and the rain forest ... and gardens everywhere. Ivory and I have several routes through the forest... always a meadow or river to explore, or up and down the beach with all it's treasures. There are profuse wildflowers, especially in the spring... it's August now and there's still the opportunity for some pretty nice pictures of wildflowers, though they're getting fewer and farther between this late in the summer. It's been a hot summer on the Island and this year there's been a record number of forest fires. So very sad to know so many of the forests are destroyed with all the plant and animal communities that depended on those magnificent trees. The English Daisy, aka the Ox Eye Daisy, has it's own sun bursting out its middle. It's a happy little flower! Actually, it's sunny centre is about a hundred teeny-weeny flowers that draw insects like magnets. I love this prolific wildflower but not everyone does. It's been reviled by many farmers and governments who give it the honour of "nasty weed". I don't care... I love it. Wild daisies (Leucanthemum heterophyllum) by the highway in Parksville, Vancouver Island. Nikon Macro 105 mm lens, f 2.8. Texture layers by French Kiss Textures. This technique is what's called 'shooting through' - meaning, shooting through all the flowers to focus on one that stands out above the others. That's important, choose just one that's different in some way from the others... height's an excellent choice. To get pictures of wildflowers like this, look for large fields or areas beside a highway where there are thick groups of blooms. A few sparse flowers won't work for this. 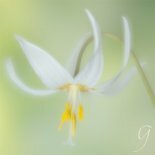 The Lensbaby is perfect here... it adds an even softer glow. If petals from other flowers are touching or nearly touching your lens... that's great. You'll get the white glow in your photo like I have at the bottom left corner. Choose a wide aperture so there's only 1 flower in focus and all the rest are blurred. I used a micro Nikkor 105 mm macro lens for this photo. Take lots of photos from all different areas. Move around and get both vertical and horizontal viewpoints. The more you take, the better. Chuck any that have solid blobs of white instead of smaller translucent areas. Big blobs don't make the cut! You only need one little gem to make you feel satisfied with your pictures of wildflowers. Besides, practice makes progress... plus you got time out in nature. So, no losses there. One of my kind and thoughtful friends asked me to pick out a few cards for her great aunt. Great Aunt Mary has perfected the art of the note card. She's never caught on to email. So I mailed off 5 of my prettiest flower note cards to Mary in Florida. And, she sent them on to several of her friends across the country. I got a handwritten thank you card from Mary soon after with a pretty water colour painting of a wildflower. I was thrilled to get 'real mail', too. People appreciated the time and warm thoughts that Mary put into it. And... it inspired them to do the same for someone else. Most of the images on this page are available for prints and note cards. 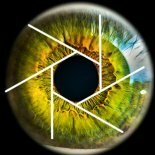 Please contact me if you would like photos that you don't see in my shop. If all you're getting is bills and junk, maybe send a friend a note card and start a trend. ...lovely to photograph, but don't put me in your salad! 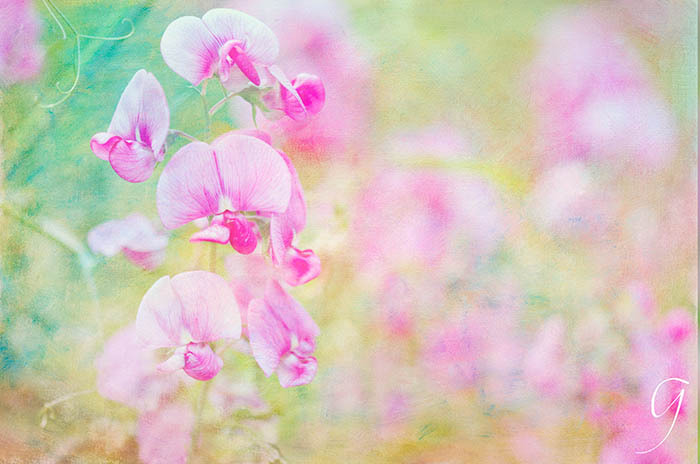 The wild version of the sweet pea has a smaller, more delicate flower than the 'improved' cultivated varieties. By the way, the little wild sweet pea isn't an edible pea... not in the pea family at all, and it's poisonous for you and your pets if you eat it. Though, they're lovely to admire or add to your pictures of wildflowers collection. 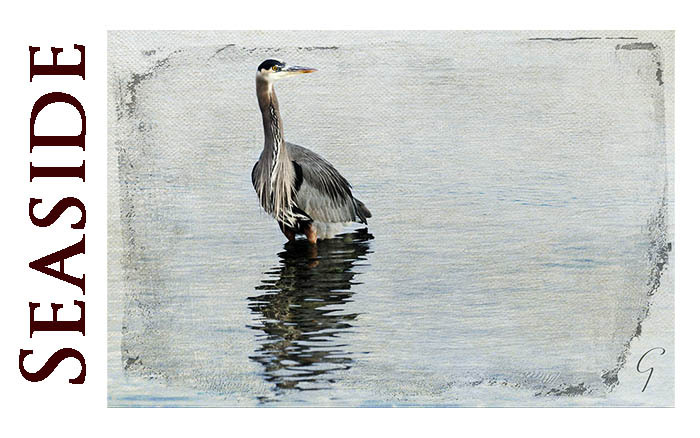 I love this image and it was a natural for the pastel, painterly textures. Wild Sweet Peas (Lathyrus latifolia) growing along the Island Highway, Oceanside, Vancouver Island. Texture layers applied in Photoshop. 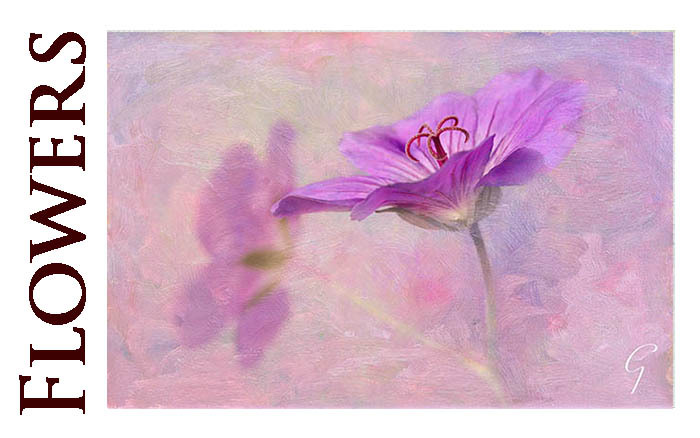 A softly pink, pretty wildflower and fun to photograph with a Lensbaby. There's nothing 'common' about the Wild Sweet Pea even though it's been labeled a common invasive plant... it grows thick on the south side of Vancouver Island and the mainland, especially along roadsides. A Franciscan monk from Sicily took a special interest in this plant... a botanist, Father Cupani, shipped off some wild sweet pea seeds to a botanist in Britain. That was 1699 and sweet peas have experienced a whole lot of change since then! Like all other flowers you buy at a florist or plant in a garden, they're regularly being genetically manipulated to create new cultivars. Ever seen a frilly sweet pea? Taking some time out in nature to get a little peace and quiet... maybe doing a bit of photography? How about a few tips to brush up your skills? Here you go... a helping hand to improve your wildflower photography.. I've met up with wild lupines in various areas of BC. 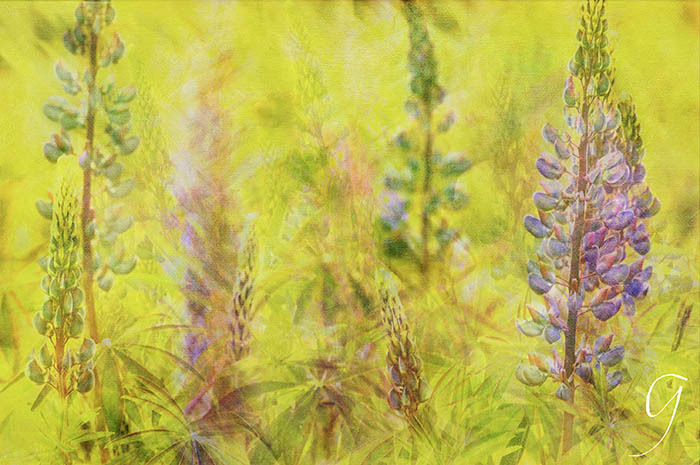 The landscapes were diverse... lupines aren't fussy about what kind of terra firma they sink they feet into. Except, they draw the line at standing in water. One weekend near the end of my courses, my landscape photography instructor took the class on a trek to the top of Black Tusk in Garibaldi Provincial Park. In full disclosure, we drove more than half way up the mountain... it's an immense mountain. The hike up the last half was cold, wet, foggy, and long... but totally awesome. On the way up, we rested at a number of alpine meadows full of lupines and other wildflowers. A dazzling spectacle with the jagged snow-topped mountains and blue sky streaked with angry storm clouds off in the distance. One of the photos is right here. It's a scanned 35 mm slide, edited with painterly textures. As well as the landscape mountain vistas, we all got some amazing pictures of wildflowers that day. Wild lupins (Lupinus perennis) in the meadow at Green Timbers Urban Forest in Surrey, BC. Photo taken with Nikon telephoto 28-200 mm. I worked in South Korea for several years but I took a year out in the middle and came home to BC. These wild lupines live in the Green Timbers Urban Forest, a huge second-growth forest about a kilometer from where I lived. I spent nearly every morning that year running the 10 km of trails and photographing the diverse plant and animal life in this peaceful, protected area. I got both of these pictures of wildflowers in South Korea. I taught at Daegu University for many years. The campus has exquisite gardens everywhere, a large forested area and a breath-taking duck pond covered in waterlilies... just like Monet's Giverny. They bloom from spring to late summer. A large number of Mandarin ducks call the pond their home. The pond nestles into the bottom of a tiny valley and dormitories sit at various levels on the hills surrounding it. The pond was my favourite place on campus! 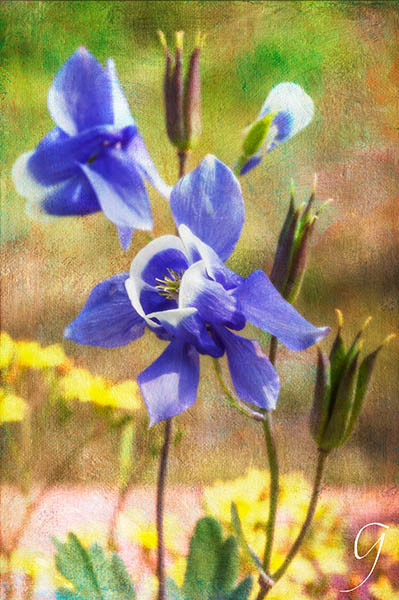 The Fan Columbine (Aquilegia flaballata). It's native to Japan and Korea. These are growing in South Korea. This Columbine is now rare in South Korea but it's native to the country. The Korean name is Haneulmaebaltop 하늘매발톱. Here's Aquilegia flabellata growing outside the apartment I lived in on campus at Daegu University. There are several of them so I didn't have to go far to get some beautiful pictures of wildflowers. I was lucky when I decided to take these photos. I had no idea how scarce they are in the country now. 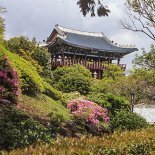 They are part of the protected, rare plants at Yanggu Eco-Botanical Garden in Gangwon-do, in the northern part of South Korea. Another place you'll find it in South Korea is around the Sangumburi Crater on Jeju Island... talking about Jeju makes me want to get on a plane. I only had to hike outside my front door for these pictures of wildflowers, but there were several long, arduous hikes through the South Korean countryside packing my camera gear as well. On Jeju Island, the hike to the top of Halla Mountain was spectacular, but if you decide to take on that climb, my advice... no tripod, one lens, one camera body. It's a grueling trip up and coming down is just as challenging, especially when you're exhausted. But PS.... it's worth it. Anyone remember the TV series "The Flying Nun" where Sally Fields" played a naive and bungling young nun? A gem in my weekly childhood television diet... loved it. Well, this "Granny's Bonnet" makes me think of Sally in her large habit and 'wings'. I didn't have a Lensbaby when I took these photos. The macro 105 mm lens did a good job.. I focused on the closest flower and used a large aperture. 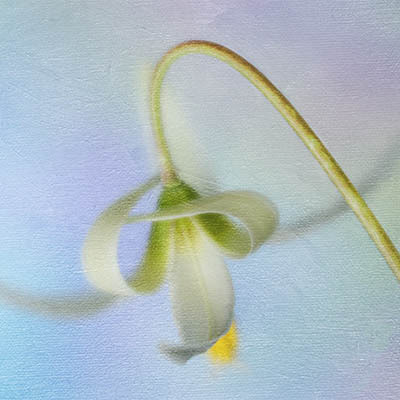 The French Kiss Textures make both these pictures of wildflowers look more like paintings. 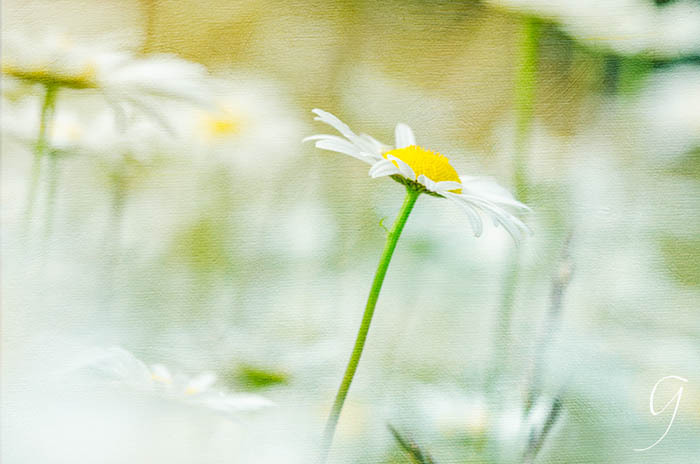 This would have been a good time to "shoot through" for some dreamy pictures of wildflowers, like the photo of the daisies at the top of the page. Wish I'd thought of it then... drat. 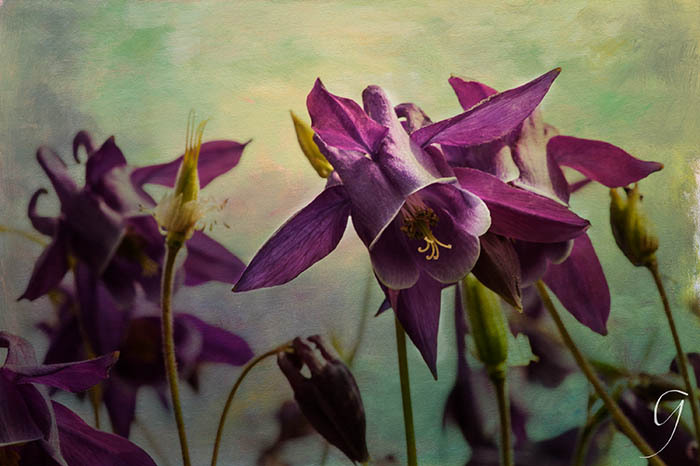 The Dark Columbine (Aquilegia Atrata) or Granny's Bonnet, is an alpine species. These are growing at Daegu University in South Korea in the dormitory area. ... Europe, Africa, Asia, NA, the Middle East and More! Since I started traveling, besides keeping a written journal, my camera's kept a record of all the places I've been. I could 'weed out' all my pictures of wildflowers from trips throughout the world and write a travel guide. It's fascinating to see the wild ancestors of plants that make up our public gardens and backyard spaces. Our garden varieties give the appearance of bigger, stronger, better..,.. but I'm not so sure about that. Call them 'weeds' if you want, but they're beautiful, persistent and adaptable. The cultivated varieties are showier, usually in lots more colours... but I l admire the courageous, adaptable wildflowers. Wildflowers are the essence of multi international festivals and celebrations. And, I remember weaving wild daisies together to make chains, like millions of other children. Lovers pull the petals off those same daisies, one by one... "he loves me, he loves me not." Imagine all the phenomenal pictures of wildflowers you could get out of those activities? 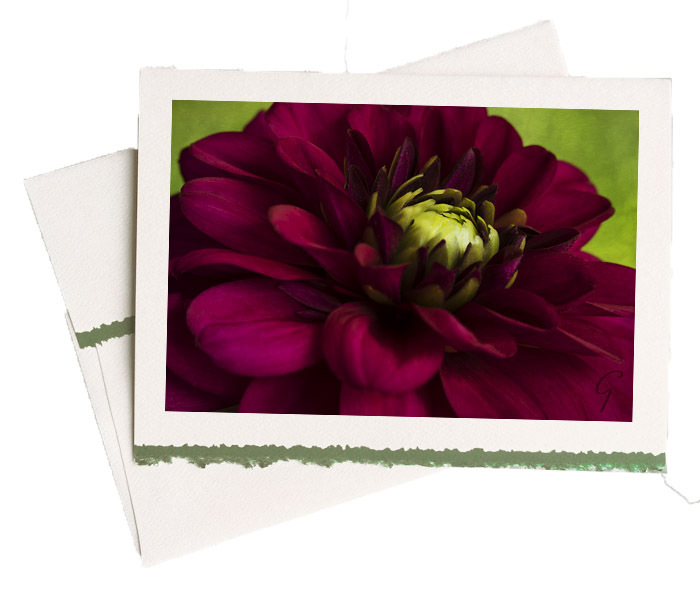 One of my great joys is producing beautiful images and it's my pleasure to create cards and prints for you. It would be brilliant if you pick a few out and share them. 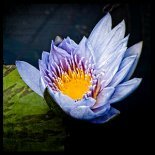 There are all sorts of magnificent flowers for you or as gifts when you visit this page. Here's where you'll find the sea lions, fishing boats, lovely seashells and more seaside treasures.